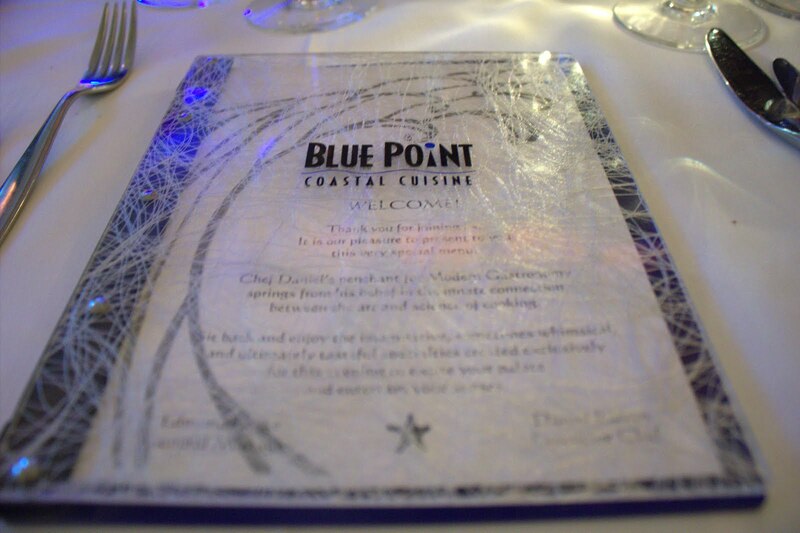 Blue Point Coastal Cuisine is one of the Cohn group of restaurants. Long known for selling an experience that was distinctly not great tasting food, the Cohn group has recently been trying to offer better food in their restaurants and hire more renowned chefs. Situated in a prime location on 5th Ave in Gaslamp, Blue Point draws in tourists and locals alike for the food regularly. Even so, The Cohn Group hired Chef Daniel Barron to head the kitchen of Blue Point approximately one year ago. Chef Barron is perhaps best known for his body of work at the previous restaurant he worked - Anqi - which was named one of the Top Ten Molecular Gastronomy experiences in the US by Gayot. Molecular Gastronomy (now being pushed as Modern Technique) is the process of using chemical agents and applying scientific techniques to food - usually to achieve better, more even cooking or to create a fun play on the ingredients to enhance the culinary experience. Chef Barron attended the American Culinary Federation Apprenticeship program in Detroit and graduated from Wayne State University. He was a James Beard Award Semifinalist for best Chef of the Southeast while working at the Mad Platter in Nashville. He then worked in Cesca in New York, Donald Trump's Premier Casino Restaurant in New Jersey, and La Playa Beach and Golf in Naples, Florida before moving to Anqi and finally Blue Point. 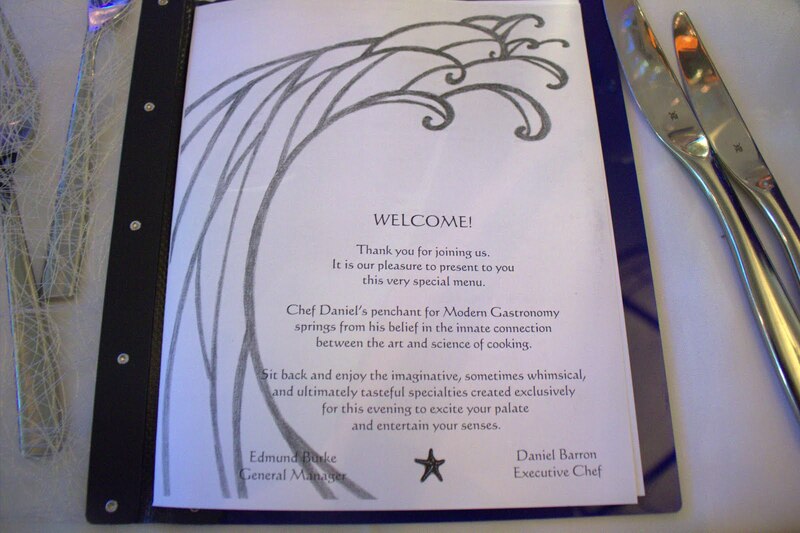 I heard about Chef Barron's molecular menu about four months ago and wanted to try it, but was never able to organize anything during the busier summer months. Determined to finally get the experience, I called the restaurant when I noticed an online advertisement for the menu, and was able to organize a dinner for ten people approximately one month in advance. 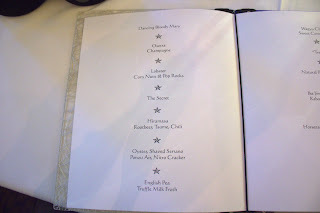 Normally, "The Experience" (as it is known at the restaurant) is only available on weeknights, but the restaurant seemed to make an exception and allow me to reserve the menu on a weekend. Perhaps as a result of the weekend day, another party of four managed to join in on the dinner with me. The course started with a cocktail. The compressed watermelon balls were made to dance around the glass using some dry ice that was dropped into the glass. The playful dancing watermelon was a great way to show off the playfulness of the food and start the course. While there was definitely alcohol in the drink, it wasn't very noticeable. The jalapeno rim was actually pretty strongly flavored and gave a big kick in heat. It was a nice surprise as it gave notice that the food would be seasoned aggressively. 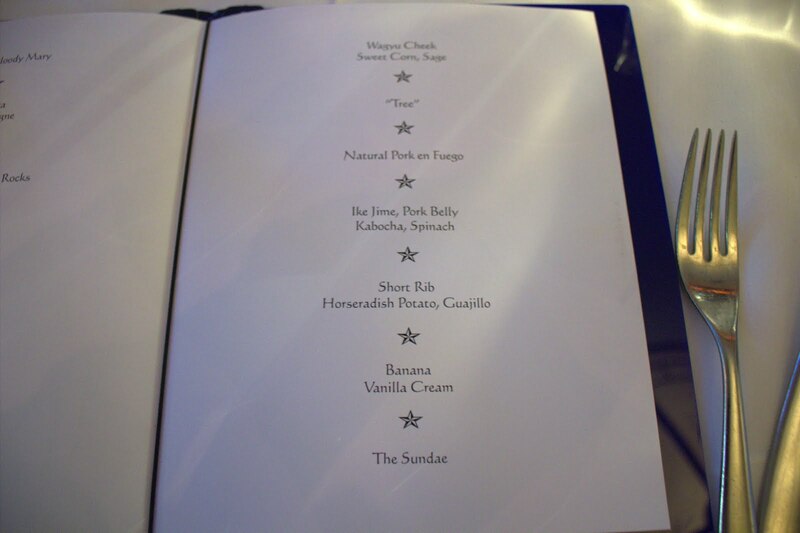 Following the cocktail, the meal progressed to what I would think of as the amuse. The acid of the citrus and saltiness of the caviar are designed to be pleasing and open the appetite for the food that is to come. Thinking of the course more as an amuse, the briny saltiness of the caviar went well with the uzu gelee. The marscapone was outstanding and would have been a great dessert on its own. Where the dish seemed to really fall flat was the mandarin orange - the orange was unnecessary with the rest of the dish except perhaps to add a little texture. The champagne gelee was also overshadowed by the uzu gelee. This preparation of lobster featured transglutaminase (aka meat glue). The lobster is first broken down and then combined using the transglutaminase before being steamed and pan fried to finish. The result is something that looks very much like a scallop, but tastes like a lobster. The pop rocks mixed with the lobster was done very well as with each bite of the lobster, the candy would pop in the mouth. The corn nuts were also a good textural contrast. The chipotle jam actually had amazing flavor on its own, but it didn't seem to go with the lobster that well. The additional sweetness didn't add anything to the natural sweetness of the lobster, and while the heat was welcome, it didn't really enhance the dish. The bread was very well done as the crust was nice and crusty while the interior was soft. The parmesan flavor really came through and matched the bread, but there wasn't a lot of truffle. 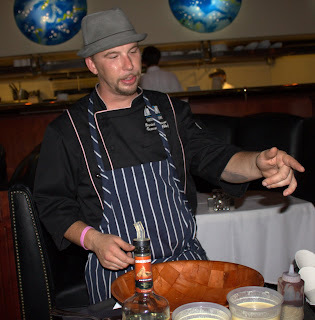 This course featured three preparations of foie gras on one plate. The left side shows the foie gras powder, which is supposed to reconstitute and taste like foie gras in the mouth after eating. The back middle (where the arugla is) contained a foie gras vinagrette that was used to dress the salad. The right side was a sous vide foie gras that was finished by pan frying. Overall, this dish was a hit. The arugla converted several haters of arugla into eating it, and the smokiness in the sous vide foie gras was a very nice and welcome flavor. The almond gel and the dried apple foam added nice elements as well. Where the dish fell flat was the foie gras powder - the powder didn't really capture the taste of foie very well when it was re-integrated. This dish was a raw hiramasa belly marinated in tsume. It is them dipped in the peanuts and coated with a root bear cotton candy. The quality of the fish was really high as the fatty flavor was as enjoyable as a high quality slice of sashimi. The tsume added a nice depth of flavor, and the peanuts a textural crunch. All of this was thrown for a loop in the end by the root beer flavored cotton candy. This is one of the dishes where I can appreciate the risk of wrapping the fish in the cotton candy, but I wasn't a fan of the preparation. I would have enjoyed the dish just fine without the cotton candy. The oyster was a hama hama oyster tenderloin that had the other parts of the oyster trimmed off. When this dish came out, the ponzu air really added a sense of smell the dish as the fragrance attacked the olfactory senses. The serrano chili was placed to cut the richness of the oyster, but it was incredibly strong and the heat hung on the the back of the palette. Overall, this dish came down to whether or not you like oysters - those that liked oysters liked the dish while the ones that didn't were not converted. This was the best dish of the night both in taste and playfulness. The one squeezes the syringe directly into the mouth the get the soup, which was very well done. However, what really elevated the dish was the complexity added by the ground espresso. The additional coffee notes really made this dish a winner. This dish followed closely behind the previous course as the best dish of the night. The cheek was cooked to be extremely tender, and the cilantro gremolatta paired perfectly with the cheek. The greens complimented the flavor of the beef and gremolatta very well. I didn't see the need for the corn and bacon puree, but its presence didn't detract from the rest of the dish. At this point, Chef Barron explained that he wanted to have a palette cleanser before the heavier meat courses. The result is what is known as tree. The balls were brought out on a tree and placed before us. The freeze dried strawberries were coated in an acidic fizzy compound, which caused them to fizz while being eaten. It was a nice experience that left me waiting for the heavier meat courses. This dish was fun as it had the element of showmanship for setting the plate on fire as it arrived. Additionally, the hickory chip conveyed the smokey aroma expected of barbecue to give the additional sensory element. I enjoyed this dish, but I thought it was in need of some heavy editing. Including both the blackberry chili sphere and the barbecue sauce was confusing as either could have worked with the pork, but they didn't work together. Additionally, the sphere was already on the pork, so it was hard to get it with just the sorbet. The radish puree was delicious alone, but it was completely lost in the flavor of the two heavier sauces. Overall, I had fun with this dish and it was close to being a major hit, but just needed some editing. Ike Jime is a Japanese method of killing a fish so that the flavor is not affected. Chef Barron explained that he was excited to offer this striped bass from Baja because it was killed ike jime and was a nice fully flavored sustainable fish. The bass was topped with chicharrones and placed on top of a 20 hour sous vide pork belly, which was on a bed of pureed kabocha. I really enjoyed the orange soy reduction in this dish. However, I almost felt that the bass and the pork belly were two separate elements that could have been served separately. Additionally, the shiso leaf seemed to be old and fibrous without conveying a lot of flavor. However, the dish was very well prepared and I was happy with it. The short rib was sous vide for 60 hours, and the texture resembled more of a tender steak rather than a short rib. The real winner of this dish was the horseradish has brown potatoes. These were prepared perfectly and the creamy horseradish really elevated the flavor of the beef. The short rib was well-cooked, but it seemed to be lacking one extra element to take it to the next level on its own. This dessert was a very well-prepared dessert. The cinnamon whipped cream was very tasty and every person at the table commented about how good they thought it was. The peanut butter powder succeeded this time in reconstituting as peanut butter once placed in the mouth. Overall, the dessert was not too sweet and very well balanced. It conveyed all the flavors well and give options in how to pair the pie with the additional elements on the plate. Perhaps the most impressive portion of the dessert was that Chef Barron personally came out tableside to prepare the dessert. While the ice cream itself was enjoyable, it was nice to get the tableside demonstration of the dessert and the plating. Because liquid nitrogen freezes the cream so fast, the ice cream resembled more of a frozen custard or creme brulee. It was extremely smooth and without air bubbles, so it was rich and decadent. While I was worried about the bacon being added, it really did work in this Sundae. The saltiness, cured flavor, and crunch of the bacon all added nice contrasts to the sundae. Overall, I was very happy with "The Experience." There was definitely some lack of refinement in the dishes, but I felt that this was because Chef Barron was not afraid to take risks. Serving 14 courses to 14 people in the middle of Saturday dinner service was a huge risk on its own. Yet, Chef Barron managed to pull off the meal. Chef Barron also mentioned that he prepared our entire meal on a 4x4 table using only two burners, which impressed me as well. 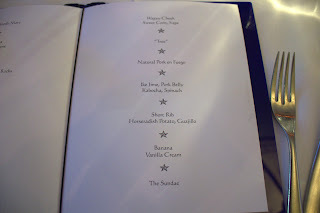 There were definitely a some nitpicks with some of the food; some food was too cold and should have been hotter, other dishes seemed to have too many components and needed to be edited. However, the food was fun to eat and tasted good on the whole. If I went on flavor of the food alone, I would not be giving The Experience @Blue Point Coast Cuisine an award. However, I've often expressed that I feel chefs should try to cook more cutting edge food and take risks. In that a Chef in San Diego is taking these risks and still produced a fun and enjoyable meal means that I would be a bit hypocritical if I judged on food alone. Thus, when all is said and done, I am giving The Experience @Blue Point the megabyte award. The technique used is very interesting to say the least !